The Disney Boardwalk is so tucked away in the corner of Epcot that it usually takes a few trips to Walt Disney World to find it. Once you do, however, you’ll find yourself wanting to go back again and again. The Boardwalk atmosphere is fun, and whimsical, and easygoing. Pastel colors, cute resorts and little patches of sand make The Boardwalk more like a seaside vacation than one you’ll find in central Florida. Here’s a quick guide of everything the Boardwalk has to offer, and secretly, why its one of our favorite places to go. Where is the Disney Boardwalk? You can find the Disney Boardwalk a few different ways. On any Disney map it will look like a little island disconnected from everything, and in some ways that is its appeal. From Hollywood Studios: Take any Disney Bus to Hollywood Studios or drive there. Walk towards the front gates of Hollywood Studios but instead of going through the gates, turn to your right. Here you will see a sign leading to the path. From there, just walk along, about 10-15 minutes, and the entrance to The Boardwalk will be at the end of it. From Epcot: Enter Epcot and head back to the World Showcase. It won’t matter which direction you choose. At one point you’ll arrive in France, or England. In between these two countries is a pathway called the International Gateway. This pathway will take you past a gift shop and you’ll walk through “exit” gates out of Epcot. Don’t worry, you’ll easily get back in later. Once you clear the exit gates you have arrived. 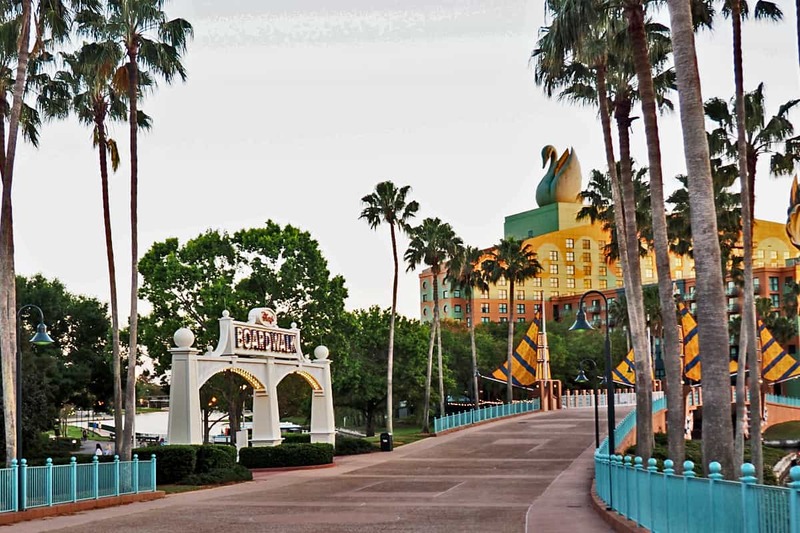 From the Swan and Dolphin, or any other Boardwalk Resort: The Boardwalk is home to several resorts. Staying at any of these resorts, or dining at these resorts will get you parking privileges. You can also follow the signs, if driving, to the specific parking lot designated for The Boardwalk. 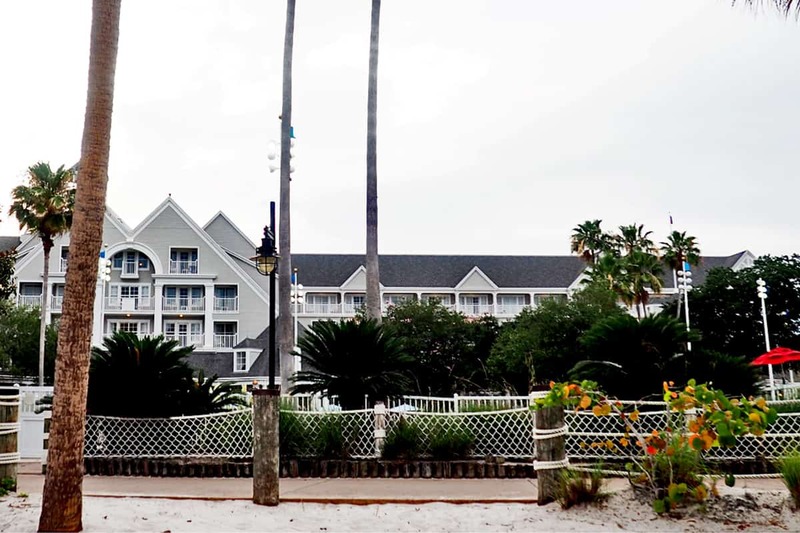 The Swan and Dolphin, The Yacht Club, The Beach Club, and The Boardwalk Inn are the resorts in this area to visit for easy access. 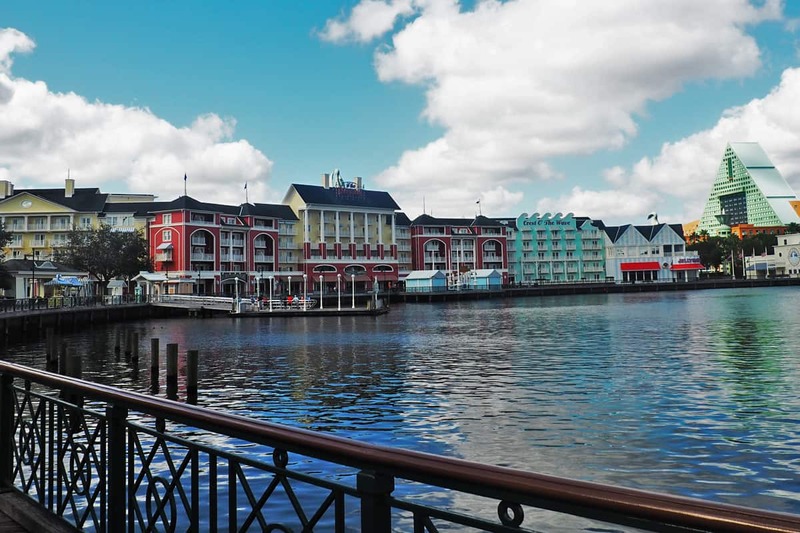 What is the Disney Boardwalk? 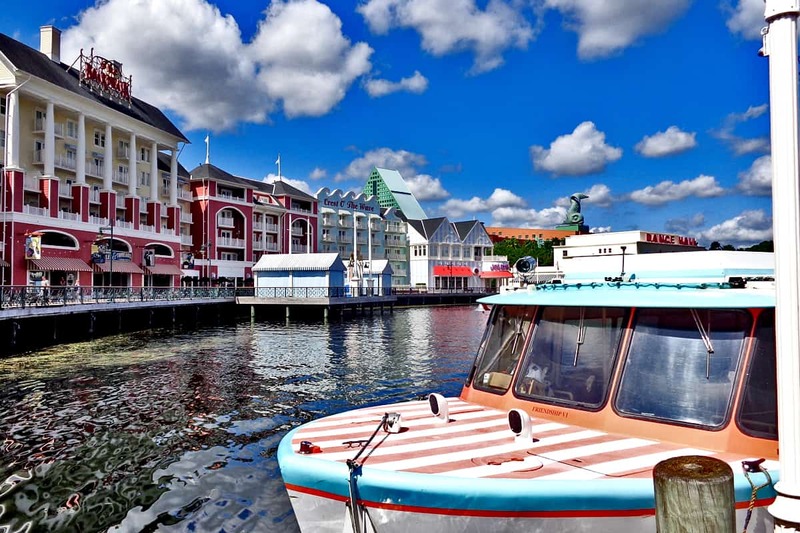 The Disney Boardwalk is historically considered the more “adult” area of Walt Disney World. Don’t get the wrong idea about this though, as a turn of the century Atlantic City themed playground you can experience a dueling piano bar, a dance hall, street performers, and a photo booth. There are beaches and little boats that take you from one side to the other. 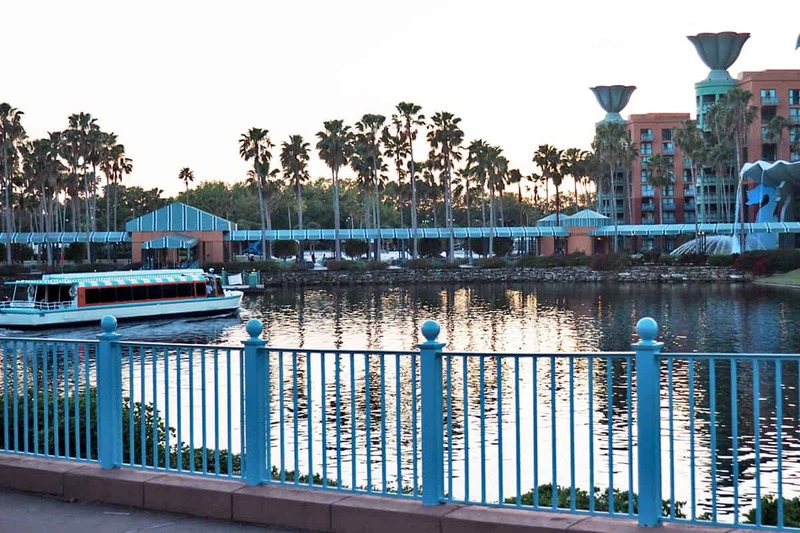 You’ll find shops, restaurants, and a calmer atmosphere than you’ll find anywhere else at Disney. 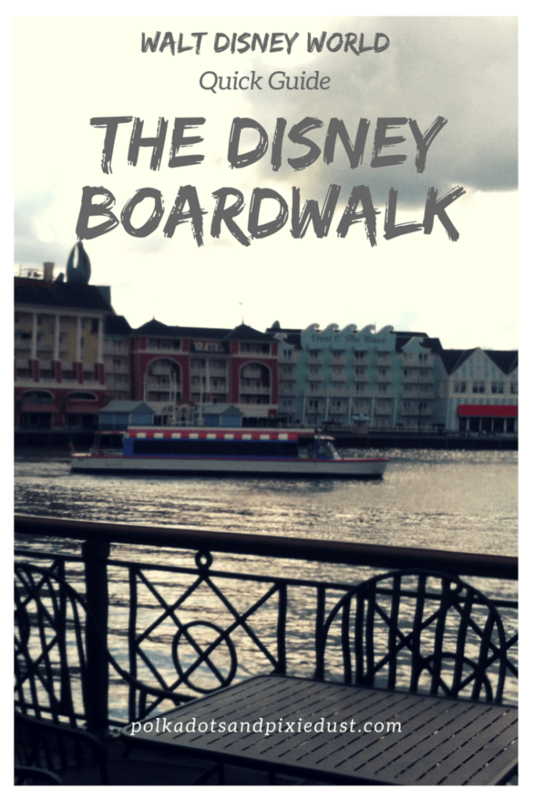 What can you do on the Disney Boardwalk? 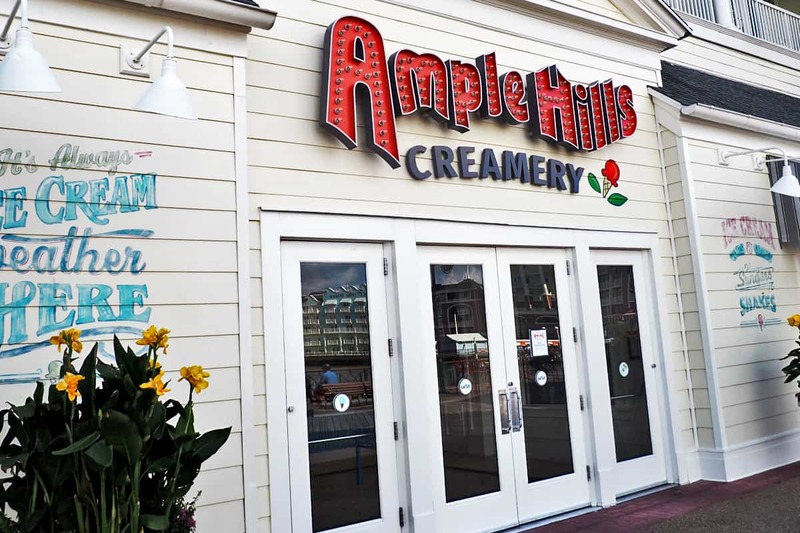 We love going here to walk, to grab cupcakes or ice cream, and to browse the shops. The Boardwalk is often the closest place we can go to get sand in between our toes. The Beach and Yacht Clubs both have little beaches that are perfect for lounging, or an afternoon lunch. We also love this area at night. The Boardwalk has jugglers, magicians, and at night you can see the fireworks from Hollywood Studios right over the water. 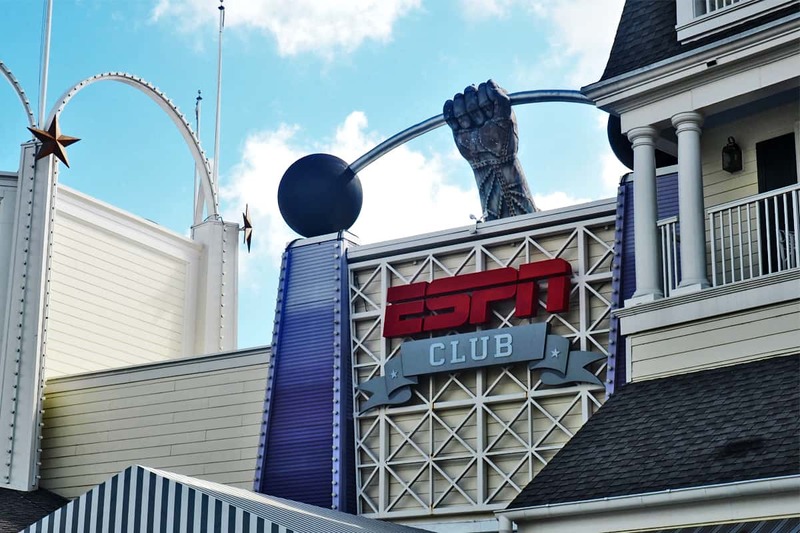 The ESPN Club is exactly what it sounds like. A typical American sports bar with typical American food. It’s basically where all the dads, brothers, uncles, grandfathers and any other man in your family will simply want to go to hang out and watch sports to avoid yet another Disney character meet and greet. This is an ice cream shop. People visit the Boardwalk just to get this ice cream. A variety of flavors, sometimes seasonal, are always welcome especially in the Florida heat. We’ve of course seen people eating this in 35 degree weather in Florida too, because it’s just that good. If you want to spice it up a bit, you can ask them to add rum to your favorite scoop. 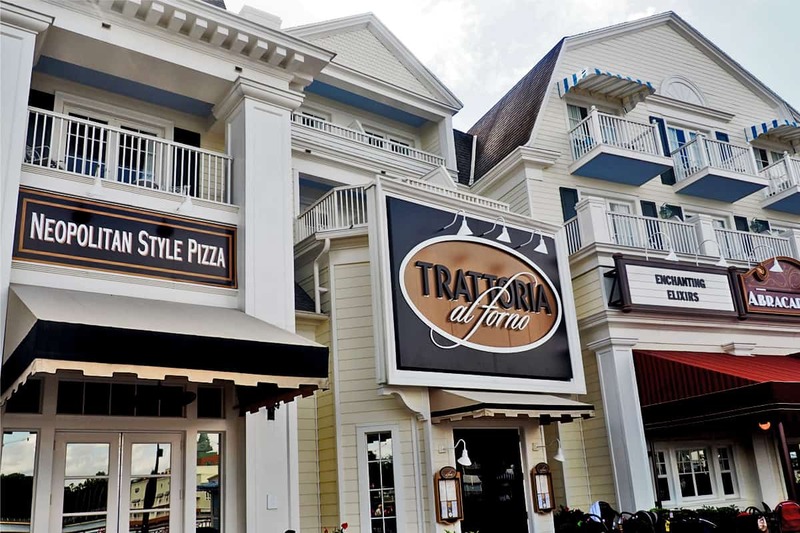 Trattoria al Forno is home of the Bon Voyage Breakfast, featuring Prince Eric, Ariel, Rapunzel and Flynn Rider. Definitely one of the better character breakfasts in all of Walt Disney World. Traditional Italian food, things here can get a little pricey. But if you like wine, this is the place to be. You can also grab a decent pizza here at the Pizza Window if you’re eating on a budget. Best eaten at a table outside on the boardwalk. The Big River Grill is American burgers and beer. It’s been getting rave reviews and has both indoor and outdoor seating. If not for dinner, this would be an excellent lunch to help fuel the rest of your day. 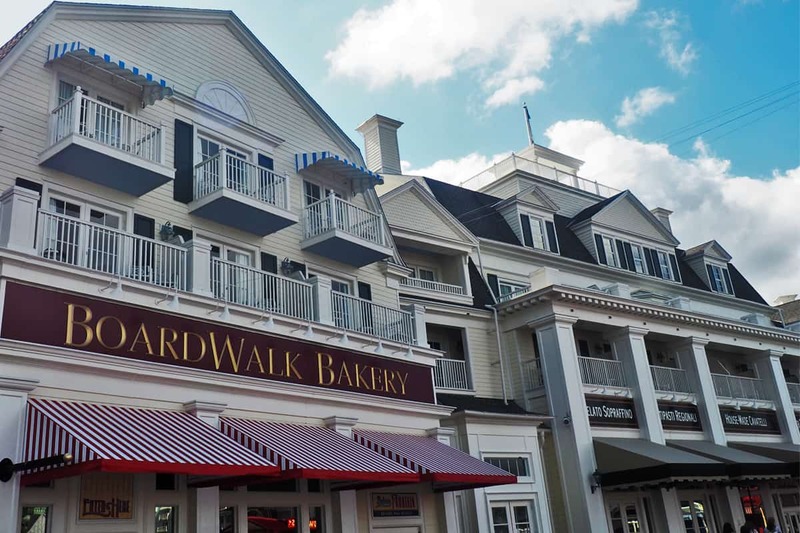 Known for sweet things and breakfast and quick sandwiches, the Boardwalk Bakery is relatively good. Not by any means as good as breakfast or sweet things in Epcot-France, but if you’re in the area it’s definitely worth a visit. A higher end seafood restaurant, this place feels like old New England in the 1920’s. This is a fancy place and worth 2 credits on the dining plan. If you’re toting kids, you may want to check the menu first. It’s also the home of the AbracadaBar where you can find extra special fancy drinks. The Yacht Club is the more grown up of the Club resorts. It is known for a pool that has sand on the bottom and wide deep porches with rocking chairs. The Beach Club is known for a lobby that smells like aloe and cucumber. And if you can pull yourself away from the lobby you can visit the plethora of restaurants these two resorts share. 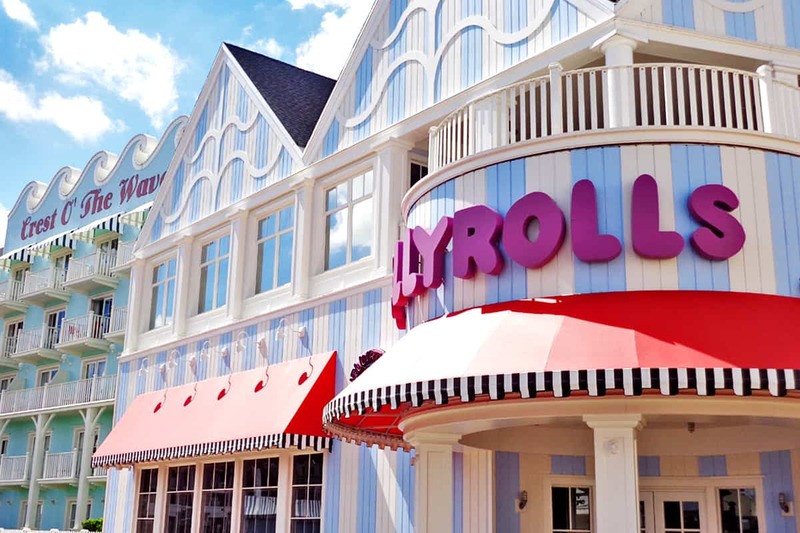 You can try Beaches and Cream Soda Shop, an ice cream parlor and restaurant or Cape May for a buffet meal with seafood and pasta at dinnertime. The Yachtsman’s Steakhouse and Ale and Compass are both grown up food options here and can add extra elegance to your vacation. The resorts also share a poolside quick service restaurant, called Hurricane Hannas which offers a pretty decent lunch option filled with options like falafel and fries. Hidden between the Espn Club and the Boardwalk Bakery, the Inn is decked out with Coney Island type decor, stripes and a feeling of the county fair. It also has a lawn which routinely fills with kids playing frisbee or people lounging about reading. Does the Disney Boardwalk Cost Extra Money? No! 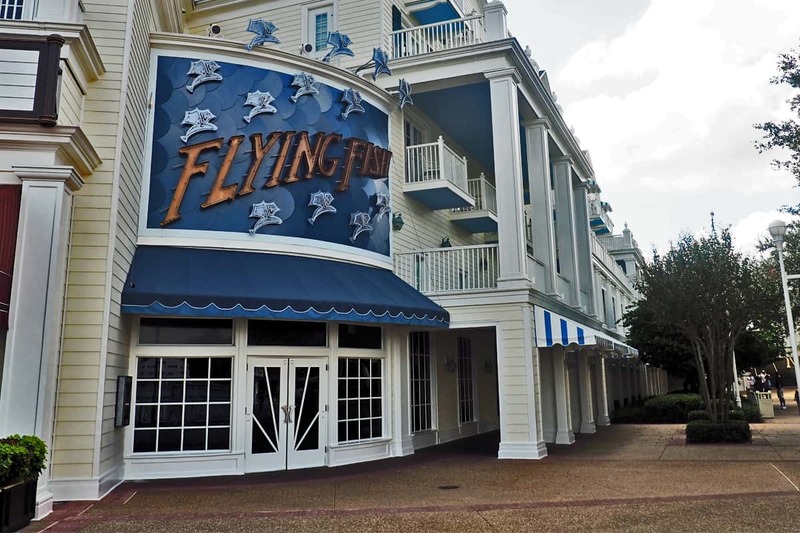 While it is part of Disney Parks, you can simply visit and browse, much like you would Disney Springs. You don’t need a ticket, and there aren’t any rides to fast pass. You can simply show up anytime and enjoy. We hope you enjoy the Boardwalk next time you visit Disney. W’re sure you’ll enjoy it as much as we do!